A musician and labourer was last Tuesday granted bail after denying that he stole over $200,000 in goods and cash. 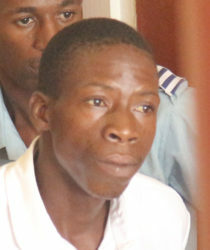 Dexter Rosemay, also known as ‘Passa Passa,’ appeared before Chief Magistrate Ann McLennan where he was read a charge that on April 24, at Tabatinga, Central Rupununi, he stole a gold band, valued $125,000 and $93,000 from Nafraz Shamshudeen. Rosemay, 33, of 145 Tabatinga Drive, pleaded not guilty to the charge. Prosecutor Sanj Singh objected to bail based on the fact that the address Rosemay gave the police differs from the one given in court. Rosemay told the court that he gave the police his mother’s address as well as his own address since he frequents both locations. He further stated that there was a fight on the day in question and he never stole any items since he is a well-known person in Tabatinga given that he’s a musician. He was eventually granted bail in the sum of $35,000 and was ordered to report to the Lethem Police Station every Friday until the completion of his trial. The matter was then transferred to the Lethem Magistrate’s Court.